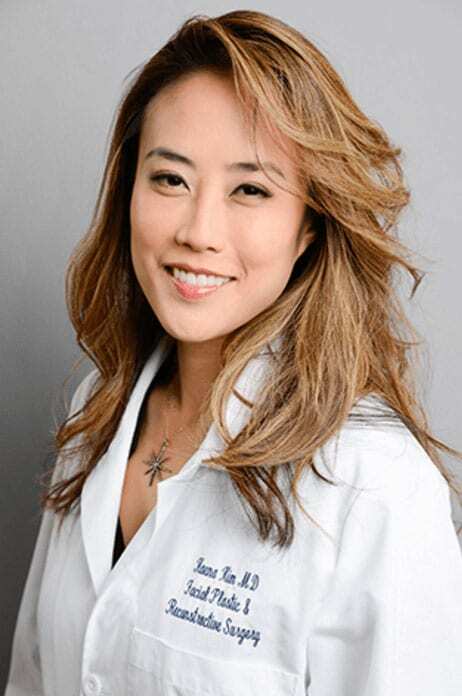 Based in the San Francisco Bay Area, Dr. Haena Kim is double board certified in head and neck surgery and fellowship trained in facial plastic and reconstructive surgery. Dr. Kim has devoted her practice exclusively to the beautification and reconstruction of the face and neck. With extraordinary artistry and surgical precision, Dr. Kim addresses each patient as a true individual. She understands the importance of achieving a natural, youthful result while preserving each person’s identity. She is passionate about helping her patients achieve the best results in all aspects of her specialty including surgical face and necklift, non-surgical “liquid facelift”, neck reshaping and liposuction, rhinoplasty, rejuvenation of the brow and eye area, Asian cosmetic procedures, chin augmentation, and facial feminization surgery. Dr. Haena Kim Facial Plastic & Reconstructive Surgery also offers a wide-range of non-surgical cosmetic treatments including Botox, Dysport, dermal and facial fillers, Kybella, medical-grade facials, chemical peels, and laser resurfacing. She firmly believes maintaining the best surgical results requires utilizing the best non-surgical techniques as well. Dr. Haena Kim strives for excellence and quality results. Dr. Haena Kim completed her residency in head and neck surgery at Northwestern University in Chicago. She went on to complete an additional year studying under the nation’s foremost authorities in Facial Plastic and Reconstructive Surgery at the University of Miami. She is board-certified by the American Board of Otolaryngology in Head and Neck Surgery and a fellow of the American Academy of Facial Plastic and Reconstructive Surgery. Dr. Kim is active in the local East Bay, South Bay, San Francisco, Marin and Sacramento communities. She is an active advocate for battered women and victims of domestic violence donating both time and services to STAND! For Families Free of Violence. She is also an active member of the Walnut Creek Chamber of Commerce. For more information about the best facial plastic and reconstructive surgeon in the Walnut Creek and San Francisco Bay Area contact us at (925) 891-4135 or info@drhaenakim.com. RESIDENCY — Otolaryngology – Head & Neck Surgery at Northwestern University McGaw Medical Center Department of Otolaryngology – Head and Neck Surgery. Chicago, Illinois. INTERNSHIP — General Surgery at Northwestern University McGaw Medical Center. Chicago, Illinois. DOCTOR of MEDICINE — University of Pittsburgh School of Medicine. Pittsburgh, Pennsylvania. BACHELOR OF ARTS — Swarthmore College. Swarthmore, Pennsylvania. NIH NIDCD T32 Pre-Doctoral Training Grant. University of Pittsburgh Otolaryngology Department. Project Title: Combination Tumor Antigen Targeted Immunotherapy in Human Papilloma Virus Positive (HPV+) Head and Neck Cancer. American Academy of Otolaryngology – Head and Neck Surgery Foundation / The Alcon Foundation of Resident Research Grant. Project Title: Bacterial Inhibition by Innate Antimicrobials in Chronic Rhinosinusitis. Alderete AP, Valentine LE, Willman AM, Kim H. and Vollmer AC. 2001. The Universal Stress Protein of E. coli: Its Evolutionary Conservation and Influence in Regulating Stress Responses and Biofilm Formation, abstr. I-17. In Abstracts of the 101th General Meeting of the American Society for Microbiology. American Society for Microbiology General Meeting, Washington, D.C.
August 2006: Oral Presentation at August 2006 American Head and Neck Society meeting – Chicago, IL. “HPV-infected cancers process and present HLA-A2-p53264-272 peptide complexes despite undetectable p53 protein: implications for p53 based immunotherapy”. Abstract accepted for publication in Archives of Otolaryngology-Head and Neck Surgery August 2006. August 2006: Poster Presentation at August 2006 American Head and Neck Society meeting – Chicago, IL. “Combination tumor antigen targeted immunotherapy in Human Papilloma Virus 16 positive (HPV-16+) head and neck squamous cell carcinoma (SCCHN)”. Abstract accepted for publication in Archives of Otolaryngology-Head and Neck Surgery August 2006. September 2006: Poster presentation at September 2006 American Academy of Otolaryngology – Toronto, Canada. “Transcutanous delivery of combination tumor antigen targeted immunotherapy in HPV-16+ head and neck squamous cell carcinoma (SCCHN). Nguyen VT, Taieb A, Sacks JM, Unadkat JV, Clavijo JA, Kim H, Feili-Hariri M, Lee WP. 2007. Allopeptide-pulsed dendritic cells and composite tissue allograft survival. Microsurgery, 27(2):105-111. Sidle DM, Kim H. Keloids: prevention and management. Facial Plastic Surgery Clinics of North America. 2011 Aug; 19(3):505-515, Kim H., Suh L, Schleimer RP, et al. Evidence for altered antimicrobial properties of nasal lavage specimens from patients with chronic rhinosinusitis. Abstract accepted for poster presentation at April 2011 meeting of COSM. Hsueh W, Conley DB, Kim H, Shintani-Smith S, e al. Identifying clinical symptoms for improving the symptomatic diagnosis of chronic rhinosinusitis. Int Forum Allergy Rhinol. 2013 Apr; 3(4):207-214. October 2013: Poster presentation at 2013 American Academy of Facial Plastic and Reconstructive Surgery meeting – New Orleans, LA. “Evaluation of the effect of platelet rich plasma on recovery after ablative fractional photothermolysis”. Kim H., Gallo J. Evaluation of the effect of platelet-rich plasma on recovery after ablative fractional photothermolysis. JAMA Facial Plast Surg. 2015 Mar 1;17(2):97-102. doi: 10.1001/jamafacial.2014.1085. May 2001: Poster presentation at American Society for Microbiology general meeting in Orlando, Florida. September 2003: Poster presented at Pittsburgh Bone Symposium. “The Use of Allopeptide-pulsed Dendritic Cells for Induction of Immune Tolerance in Composite Tissue Allografts (CTA)”. April 2011: Poster presentation at 2011 COSM Meeting – Chicago, IL. “Evidence for altered antimicrobial properties of nasal lavage specimens from patients with chronic rhinosinusitis”. Dr. Kim partners with a veteran team of clinical aestheticians specializing in medical-grade facials, chemical peels and other restorative and anti-aging skin treatments. Warm, spirited and chosen for their unsurpassed aesthetic experience, our team’s philosophy is to make patients a priority and create a luxurious and welcoming environment. Every member of our office staff undergoes continuous and extensive training on cosmetic procedures, pre- and post-operative expectations, skincare and at-home patient care. They are here to answer your questions, make arrangements, keep you comfortable and make your experience as enjoyable as possible. We are nestled in the premiere medical offices of La Casa Via, across from John Muir Hospital in Walnut Creek, surrounded by upscale amenities for patients to enjoy. Ask our Concierge Patient Coordinator about luxury services and accommodations for both local and out-of-town patients. Conveniently located along I-680, less than 20 miles from San Francisco. Serving the San Francisco, East Bay, South Bay, Marin and Sacramento areas, including Contra Costa County, Blackhawk, Brentwood, Danville, Diablo Valley, Dublin, Pleasant Hill, San Ramon, San Leandro, Lafayette, Orinda, Mountain View, Pittsburg, Emeryville, Alameda, Vallejo, Oakland, Fremont, Berkeley, Hayward, and Concord. Maintaining a healthy, natural beauty always starts with a first step. Let us take that journey with you.